A majestic African elephant, entirely handmade by me in my northern California studio. 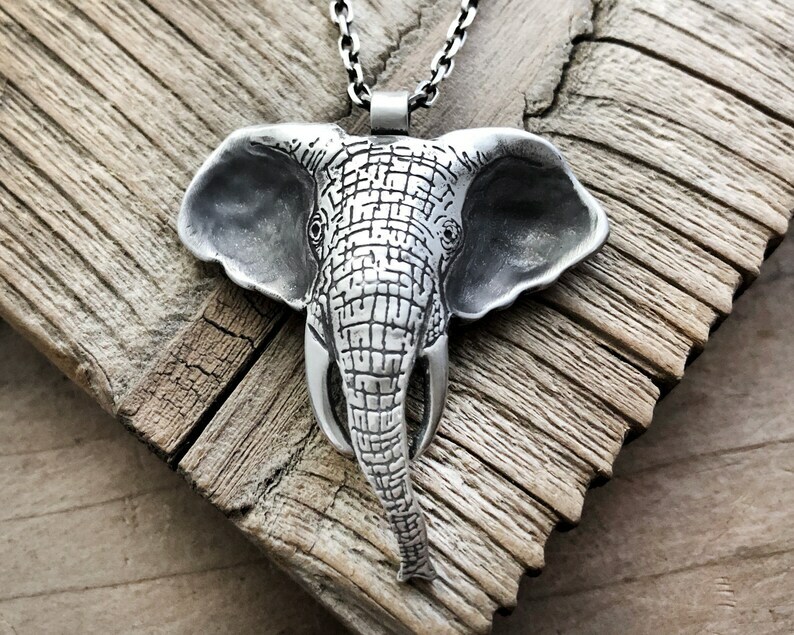 The elephant is made from .925 sterling silver. I started out by etching my drawing of an elephant onto sterling sheet. It was cut out and then formed using the repousse' technique to give it form and dimension. It measures approximately 1 1/2" at it's widest point by about 1 5/8" long including the bail (37mm x 41mm). It has a lightly polished finish and comes on an oxidized sterling chain in your choice of 16", 18" 20", 22" or 24". I can make it any length you'd like so if you want something other than what's listed let me know and I'll add it as a choice. It comes in a gift box tied with a raffia ribbon, ready for giving. Orders within the US will ship via USPS priority mail, everywhere else will be sent USPS first class. As photographed. Large and heavy piece, would need to be a necklace or in a mobile. Much wonderful texture! Love this piece of art! Would buy again. Wonderful offerings by this seller! Consistent quality. Arrived quickly and well packed. The elephant is perfect! Thank you so much.